It's summer. Back in April you were looking forward to a nice, relaxing summer in the sun, but suddenly it's almost August and you don't even remember the definition of the word "relaxing". Summer break? Summer broke your schedule! Summer broke your routine! Summer broke your peace of mind! Believe me, I know your pain. But as a keeper of journals, I also know how writing can keep some of the stress at bay. Here are six things you can do in your journal to regain control and clarity. Try just one, do them all, or any combination; I know you'll feel a little better when you're done! Take a few minutes and just write whatever comes to your mind. Word-vomit. Forget about spelling and grammar, forget sentence structure. This time that verb doesn't need a noun, and the adverb doesn't need a verb. Don't worry about staying on topic, or even making your handwriting legible. Write until there's nothing more to write. This is purely for you to unload all your thoughts. This isn't for others to read and analyze. In fact, because it's a journal, the whole point is that it's safe from judgmental and analytical eyes! Make a list of those things that are causing the most stress. Money, packing for vacation, the air conditioner broke, the car won't start, the kids are going bananas. Whatever it is, put it in a nice, neat list. Having things in a neatly numbered or bulleted list will help you feel more organized, which in turn will help relieve the stress you're feeling. See the fluff? It's all the things that you wouldn't expect on a to-do list. The things that are going to be done anyway, but don't seem important enough to make the list. Eat a snack? Put on socks? Get out of bed? Plug in laptop charger? Who lists those things?!? As silly as it is, I do. Because you see, the fluff is the most important part. The fluff is what will help you feel better. Even by just getting out of bed, I was able to cross something off my to-do list, and we all know how good it feels to get something done. So in your list, include the fluff that you always do in the course of your day. Although it'll make your list twice as long, you'll feel twice as accomplished when you complete everything. If you're more of a creative writing type, describe the most beautiful place you can think of (real or imaginary). Close your eyes and imagine your happy place--what you see, hear, smell, feel. Then write it all down, as detailed as possible. Then stick a bookmark at that page (or fold over a corner if you're into that sort of thing). People say to think of that place when you need to relax, but if you're anything like me, you find it hard to call that place up to your mind when you're feeling really stressed. By writing it out in your journal, you can go back to that page and read it any time you want. Problem solved. Write down everything you're thankful for! Make it as general or specific as you want, but make it long. Listing the things you're grateful for will help you focus on those good things in your life and take your mind off of what's causing you stress. It's as simple as that. Once you've gotten the crazy out, give your mind some time to recharge. Breathe deeply and let your heart say what it needs to say, not that your mind has unloaded a bit. Write slowly, thoughtfully. Don't worry about the words, just write whatever relaxing thoughts come to mind. Remind yourself what's important, doodle, write down something encouraging your friend or significant other said to you, or pause and don't write anything at all. Whatever you need to do to slow down and give your heart some freedom. When you're feeling stressed, your mind goes into overdrive and your heart doesn't get to be free. Reflect and free your heart. Now that you've spent a some time in your journal, take a deep breath. Your thoughts are strewn all over the page, stress-inducers are listed neatly, your to-do list is fluffier than Agnes' stuffed unicorn in Despicable Me, and you have room in your mind for that fresh summer air to begin working its relaxing magic. Hang in there! We all feel stressed sometimes, but a journal is the perfect place to unload and get back that summer-sunshine state of mind. 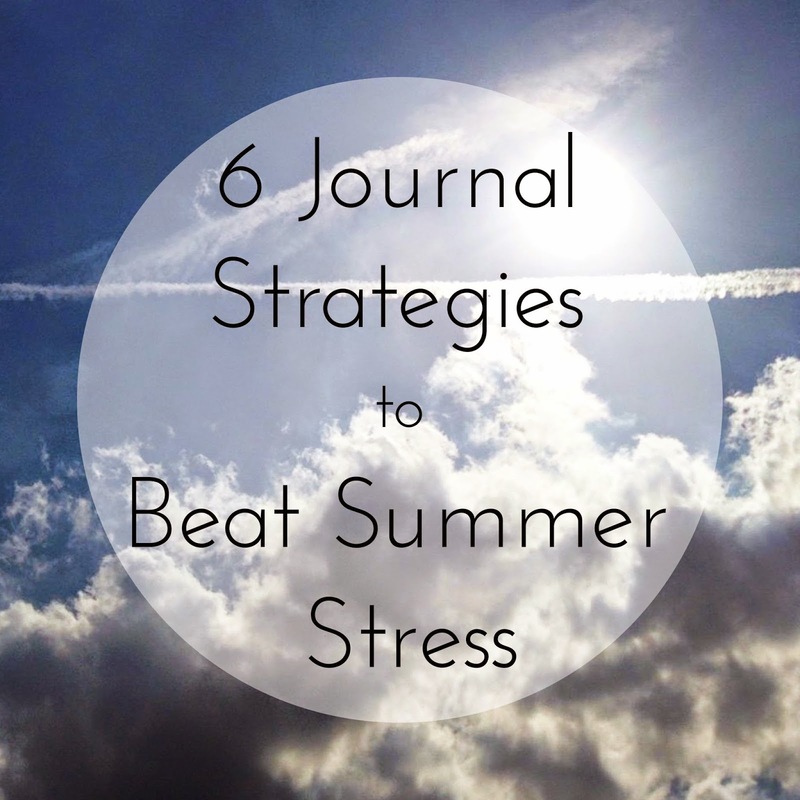 Got any other stress-relief strategies? Share them in the comments!